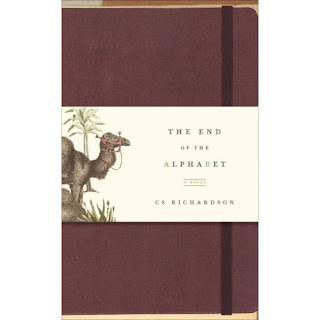 If you're looking for a short novel that will touch your heart with a beautiful story filled with romance, travel and yearning, 'The End of the Alphabet' should be your next read. The story focuses on the incredible relationship of a middle age couple ~ he an obsessive of the alphabet, appropriately named Ambrose Zephyr, and his wife, Zappora Ashkenazi. The book follows the pair from A-Z and back again - literally...as they travel around the world to destinations in alphabetical order all the while celebrating a life well-lived, and dealing with the impending loss that awaits them at journey's end. CS Richardson's prose is short but abundantly sweet. You'll easily complete his book in an afternoon, but the theme of the story will stay with you for some time. Final verdict: Have tissues handy - you'll need 'em.